We arrived in Siem Reap after a long 8 hour bus from Bangkok. The border crossing was relatively easy although there were men everywhere offering to help but you know they’re all scams that will try to con you out of your money. Tip before going: have passport photos ready for your visa and know how much it will cost you. We paid US$30 plus 100 Thai baht. We stayed in Siem Reap Pub Hostel which was okay. The bathrooms really weren’t great but for £4 a night at a place with a pool we couldn’t really complain. 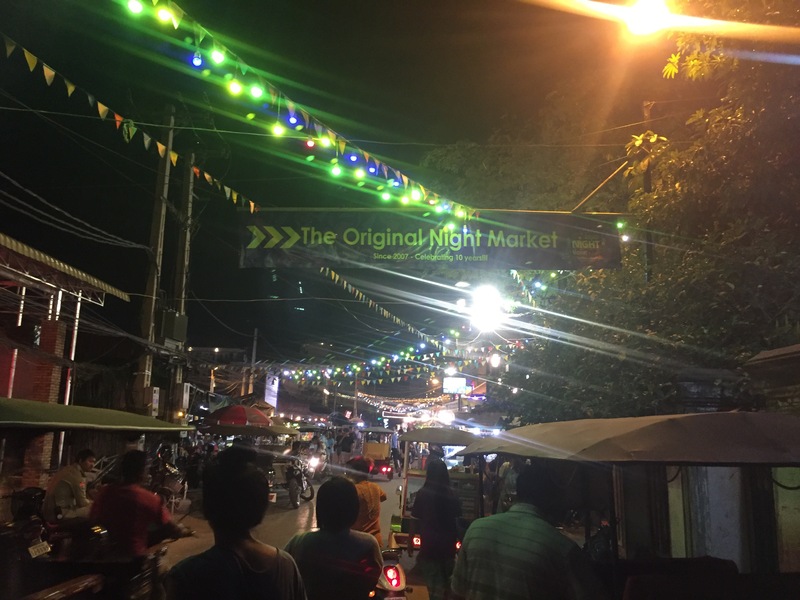 It’s just off the main night market road so we (plus a girl in our room from the Philippines) went there for food. The street was buzzing with sellers and tuk tuks everywhere and massage places and everything! 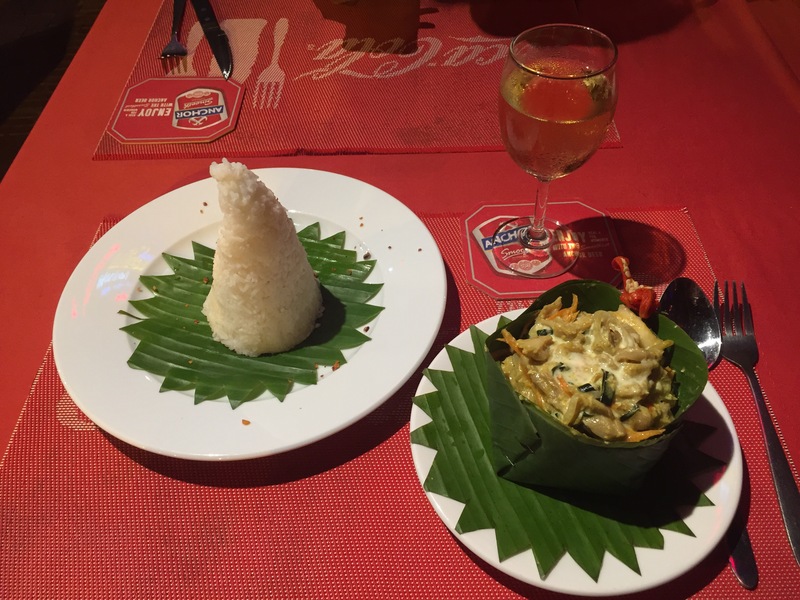 We were a little overwhelmed but very hungry and tired so we decided on the Island Bar and both ordered Pad Thai and a cocktail. 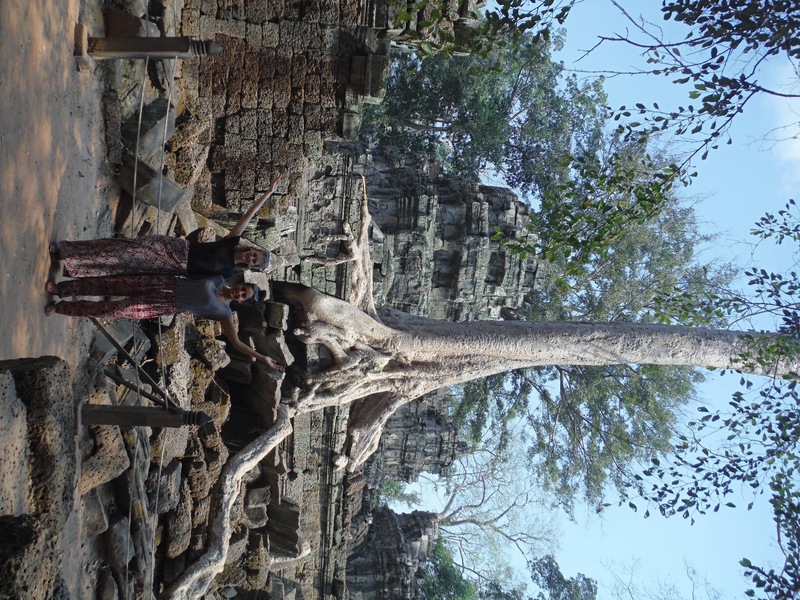 The next morning we were up bright and early at 4.15 (okay, it wasn’t bright at 4.15 and neither were we) and met our guide, Sokpee and driver Son who took us to the highlight of Siem Reap: The Temples of Angkor. 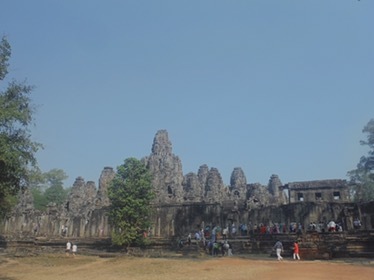 Annoyingly, just this month, tickets doubled in price (still free for Cambodians) and we paid US$62 for a two-three day pass. Along with $18 together for the tuk tuk each day and $40 together for a guide for one day, it’s been a very expensive few days but worth it! 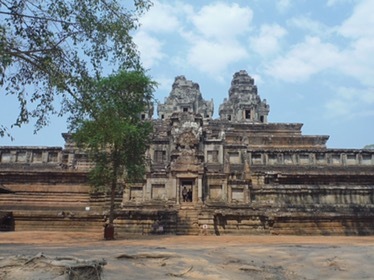 Each of the temples was made by a different King and during his life, his temple would be used for prayer and as a university for the religion. 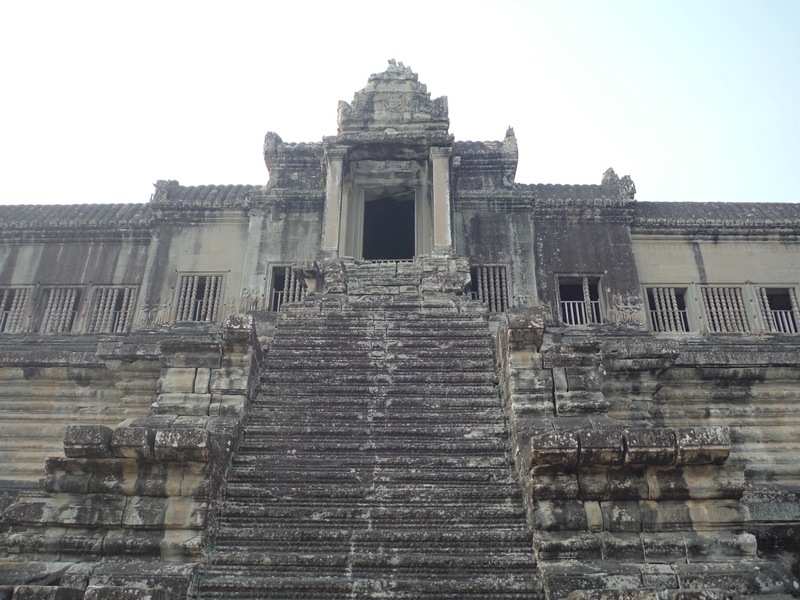 Once the King died, it became his tomb and the next King would build another temple, usually more impressive than the last and this went on from roughly the 10th century to the 16th. 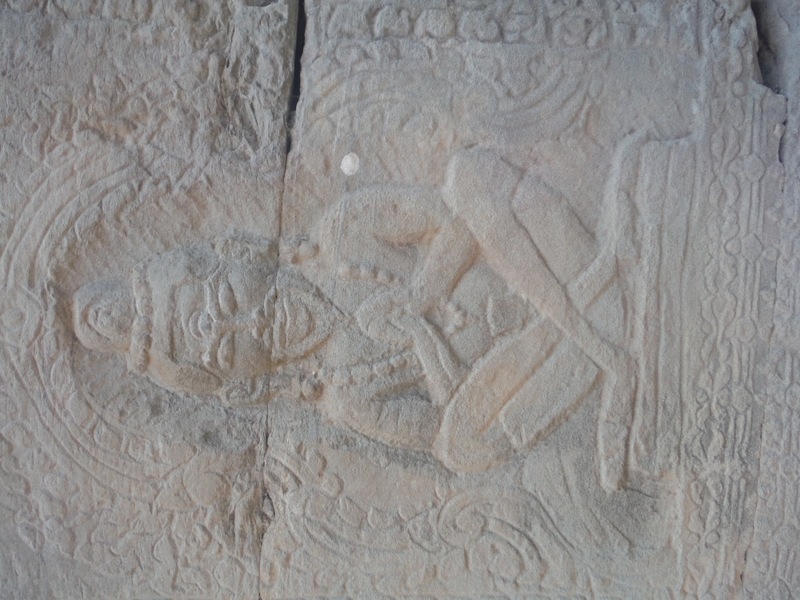 The weird thing is, when Angkor was rediscovered, no bodies were ever found. 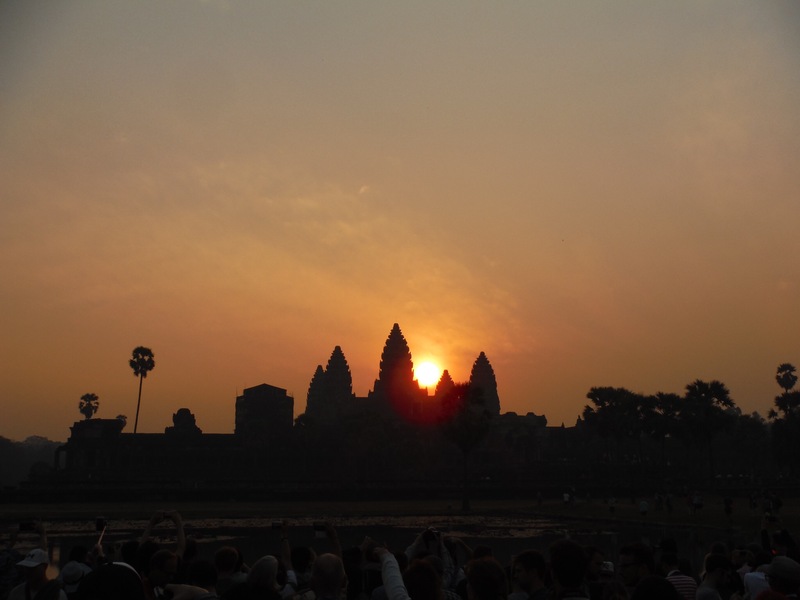 The first and most obvious stop was Angkor Wat for sunrise. It was a little busier than I would have liked it to be but I know it could have been so so much worse! I still managed to get some pretty amazing photos and all the photos on this blog haven’t been edited or filtered at all. 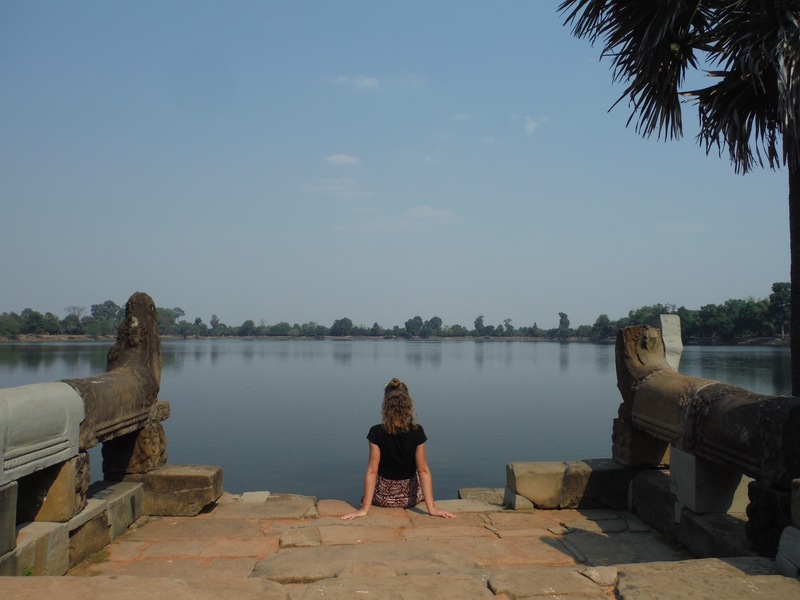 What most people don’t realise when they take all these beautiful reflective photos is that the ponds actually serve a purpose; they control the level of the moat around the temple so that it is not too swollen or too low. It’s also for common people to cleanse themselves before entering the temple to pray. The royal family would use the 4 baths of holy water in the centre of the building which represent the four elements. 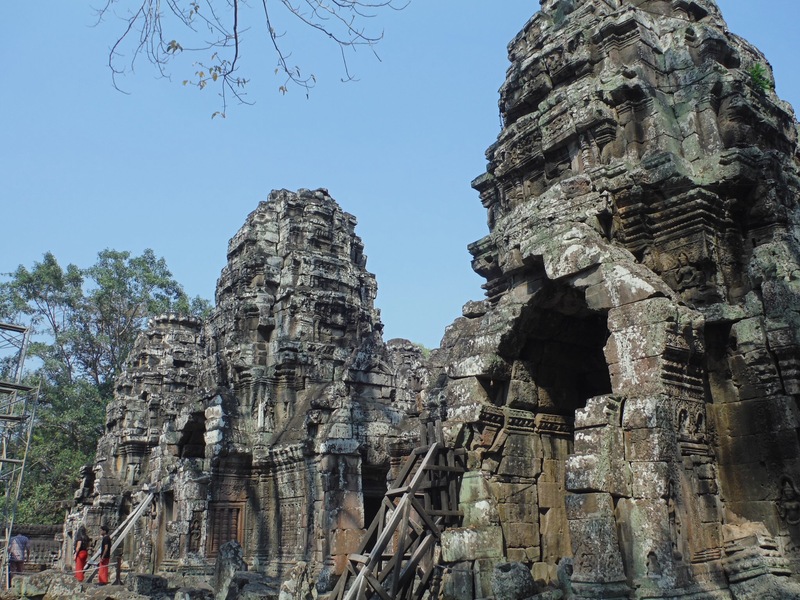 One of the things that fascinated me the most was the architecture and intricate detail throughout not just Angkor Wat but all the temples. On the walls you can see writing and religious images and patterns carved into the walls and so much of this still remains despite the fact that it is all centuries old. 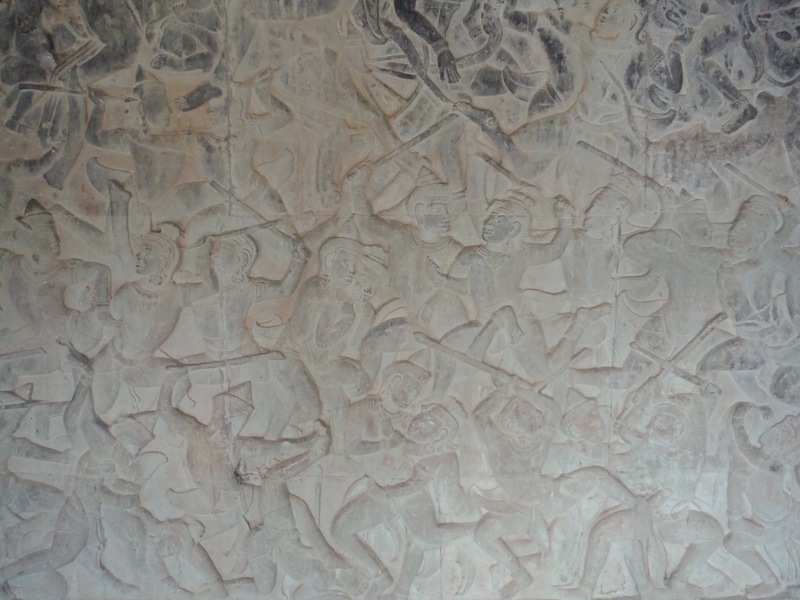 One of the first sights we had of this detail was a huge mural on one of the walls. It was a war scene and Sokpee told us about how you can tell the difference between the good guys and the bad guys. 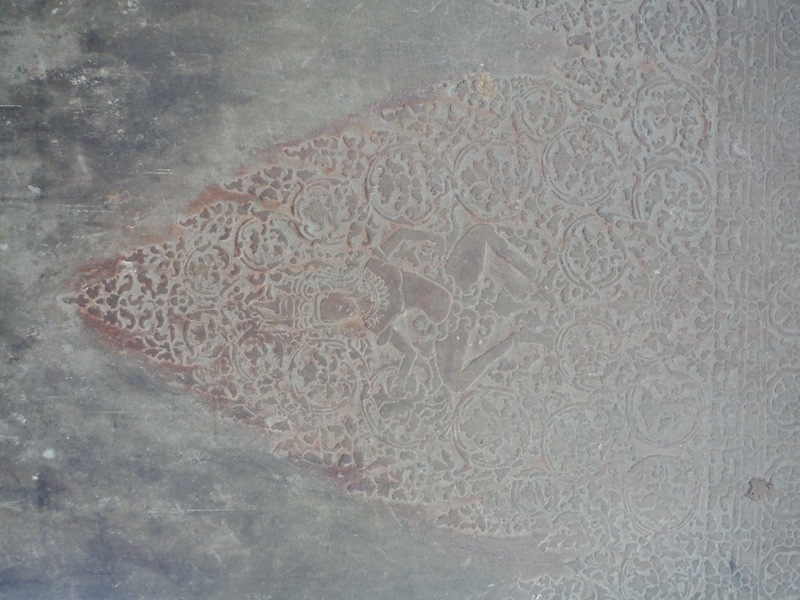 He also pointed out Vishnu and other Hindu gods and Devils. Another detail that became very familiar to us over the two days was the Apsara dancers. 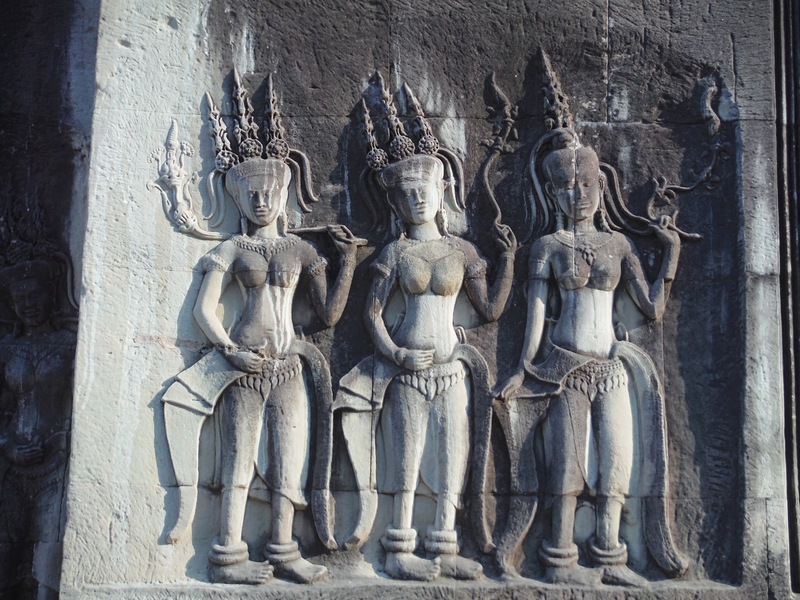 There are 1,200 of these women in total and they represent the women that used to perform for the King. The King only had one wife but had lots of women that worked for him. We then reached a viewing platform that only 100 people can be on at a time. This third level is the most holy part of the building therefore I wasn’t allowed to go up wearing a sarong made from a scarf (yet somehow proper sarongs were allowed?!) While Ammun queued to go up, Sokpee took me for a walk around the courtyard explaining that the 12 staircases up to the platform represent the 12 animals (the same animals as the Chinese zodiac). Like in China, here you would never ask someone’s age, you ask what their animal is. It sounded simple enough to me until I told him I was a rooster and he thought I was 35…. The stairs here, like in nearly all the temples, are really steep to teach respect to people who wish to pray to the gods. 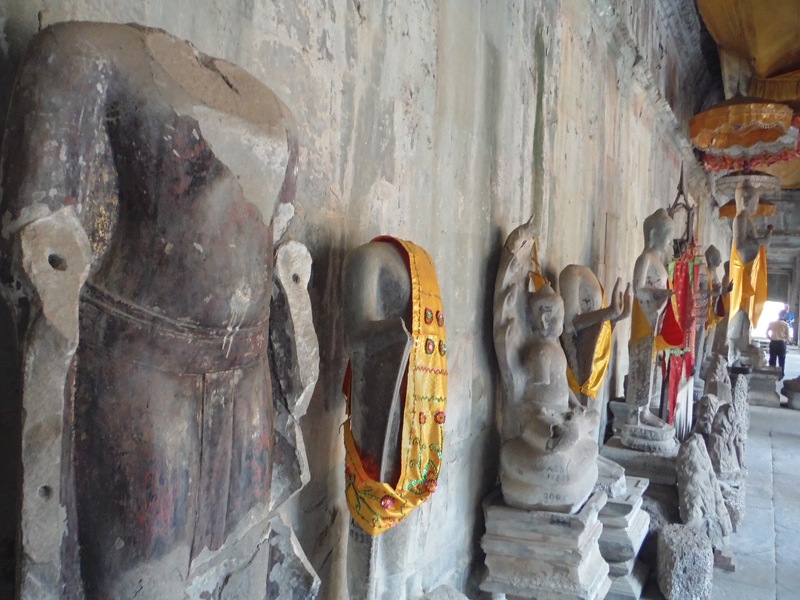 Scattered around the temple are the bodies of religious figures but nearly all without heads. Most of the heads were stolen by the Thai and black market sellers and there are only a few left with their original heads (some have been reconstructed). 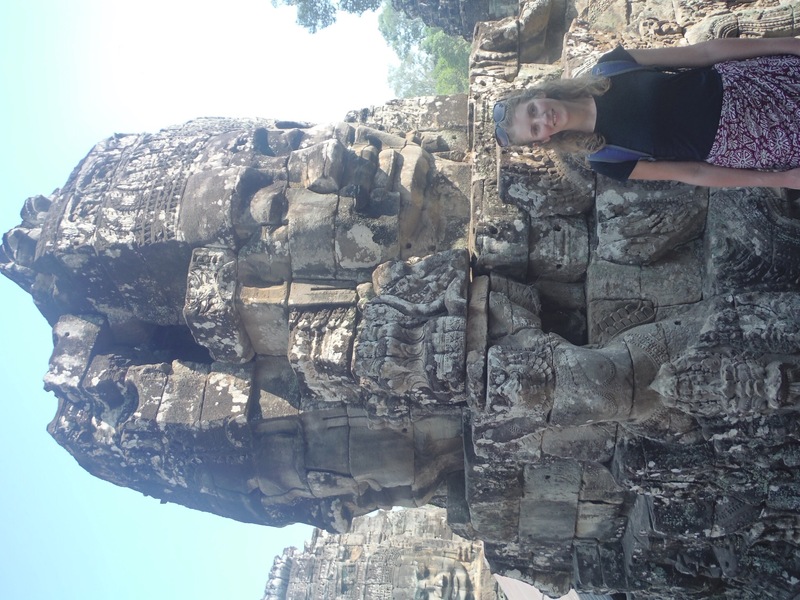 The next temple we went to is called Bayon which was first built as a Buddhist temple but was then changed in the 16th century to a Hindu temple when one King didn’t have enough money to build his own temple. 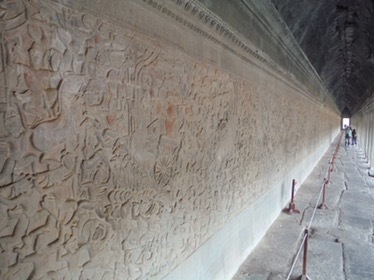 You can see evidence of where Buddhist figures used to be carved into the walls but have now either been removed or changed to Hindu figures. It used to have an impressive 49 towers but over time it has been reduced to 22 and most of the roof has collapsed too. 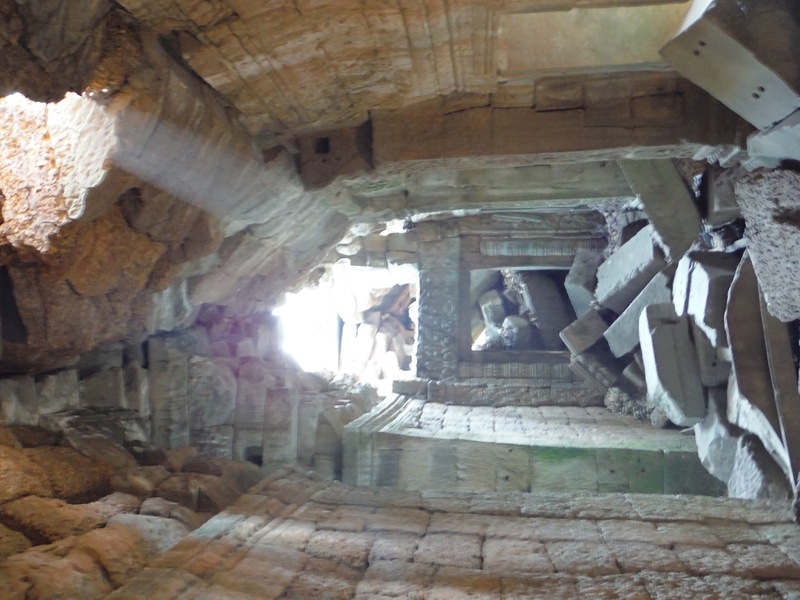 A lot of these temples have undergone conservation but they quite often have big stones left where they have fallen. We then walked about 100m to the next one which was destroyed in the USA-Vietnam war. It took years to restore and wasn’t completed until 2011. 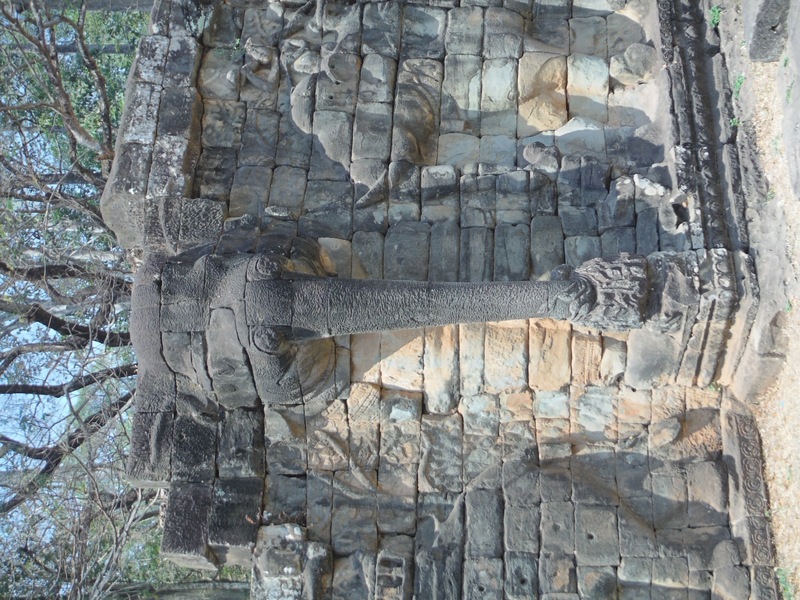 Before stopping for lunch, we went past the elephant gate which has 300 elephants carved into it. 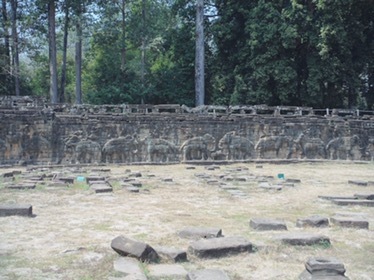 The main scene shows elephants being trained to go to war. Opposite here we saw everything being set up for the premiere of the film ‘First They Killed My Father‘ which Angelina Jolie has created from the book of the same title. Even the King of Cambodia was coming along to see it! For lunch I had yummy fried rice with pineapple and chicken and I was excited to finally have the chance to use the chopstick skills that I’ve been working on for 23 years. I was even complemented by the girl next to me who I suspect was Chinese! 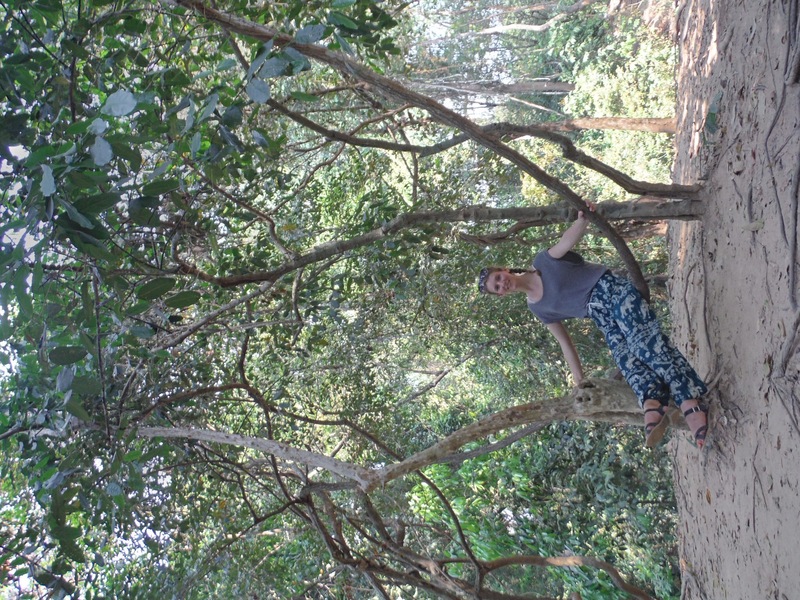 There are quite a few places to eat around the temples of Angkor and all of them have plenty of hammocks around for the drivers and tour guides to use as they work such long days. Our next stop was just a brief one as we didn’t fancy climbing the crazily steep steps. This temple was never completed and you can tell by how plain it is. During construction it was struck by lightening which was seen to be unlucky and the King abandoned it to start construction on a new one. Sadly, during the construction of this second one, the bad luck struck and the King was killed at war. As this meant the loss of the war, his temple was never finished for him. 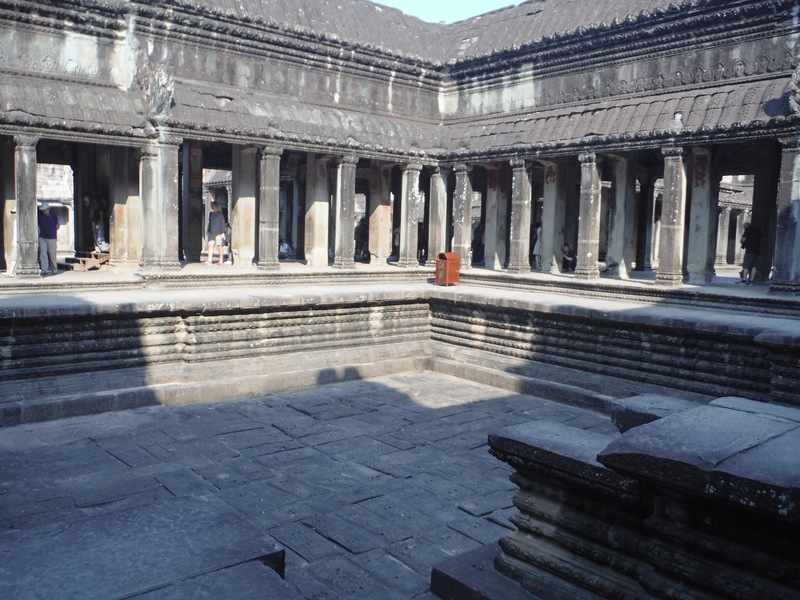 The next one was the one I was the most excited about (other than the main Angkor Wat). 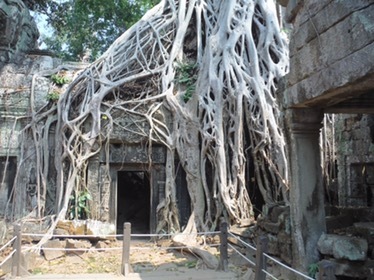 All the temples here show the power of the kings and the abilities they have whereas this one also shows the power of the jungle. 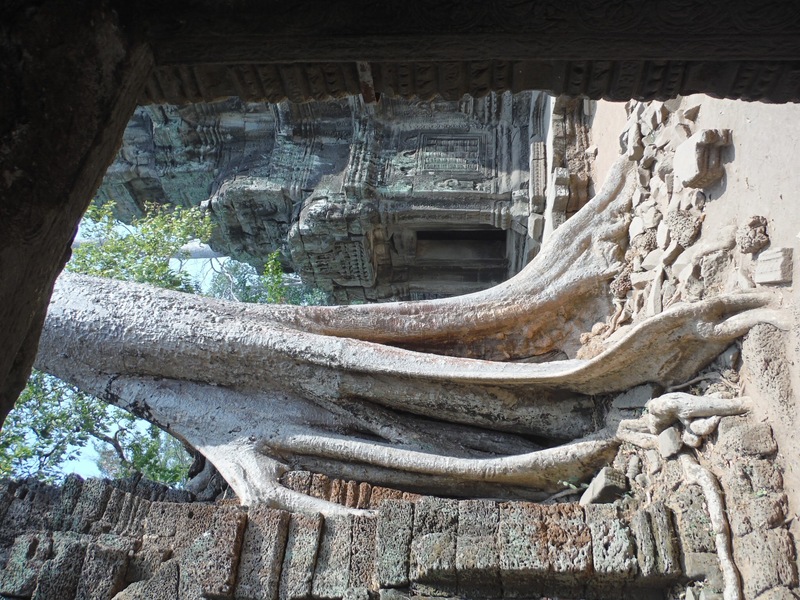 Ta Phrom is one of the most famous ones as it was the setting for part of Lara Croft: Tomb Raider. Trees have grown on top of the buildings causing them to partially collapse and look particularly eerie. You can see why the film makers chose this setting before Angelina Jolie fell through a hole into Pinewood Studios. Our last temple of the day (thank god because we were knackered!) was similar in that it had also been destroyed by nature but to a lesser extent. After leaving, we saw the massive reservoir outside. Many locals come here late afternoon for family picnics which is really cute but we just stared at it and could think of nothing else other than jumping in to wash the days sweat off of us! This reservoir is special because it is a natural reservoir that has never ever ever dried up. 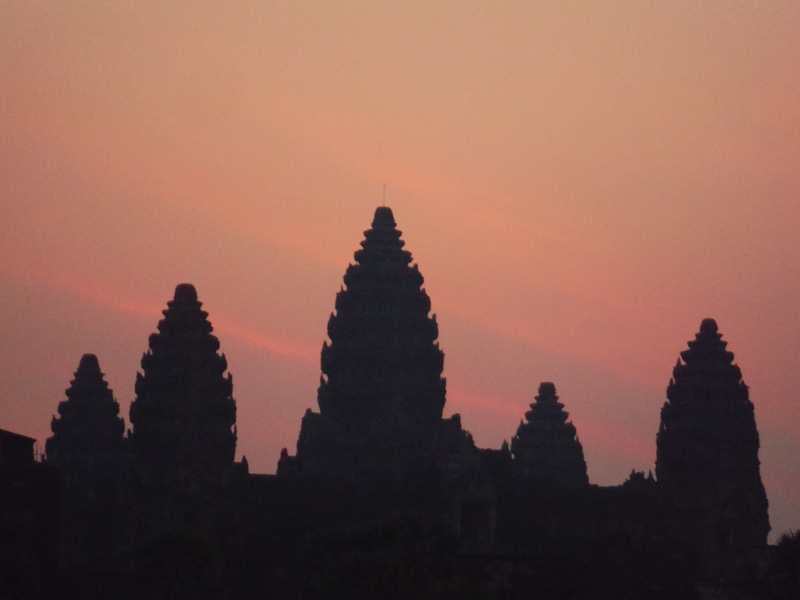 That is, until last year when Cambodia had a particularly dry period! That evening we sat by the pool for a bit and then went out to the night market for some dinner and some shopping. 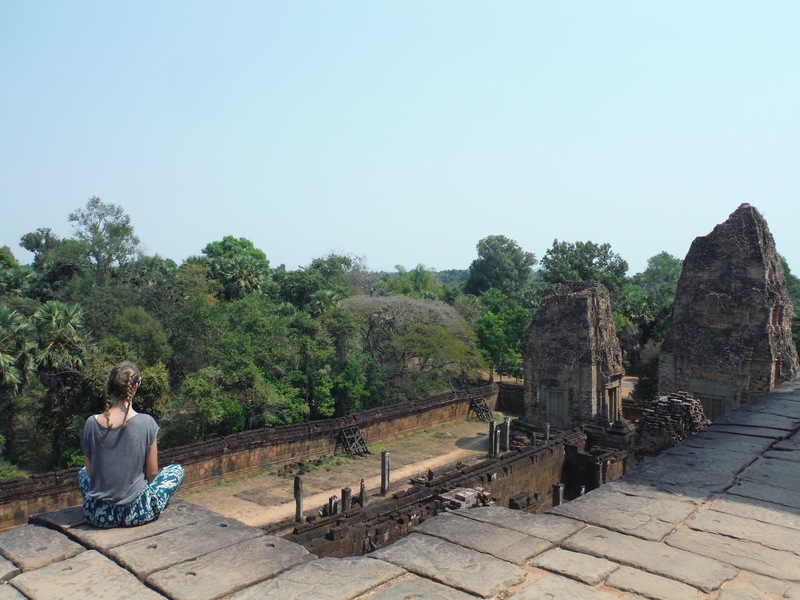 I bought some baggy elephant trousers for the next day at Angkor, some tiger balm and a postcard for my postcard collection. We also went and got a massage for $2.50 each which mostly consisted of feet and legs and a little bit of back, neck and shoulders. 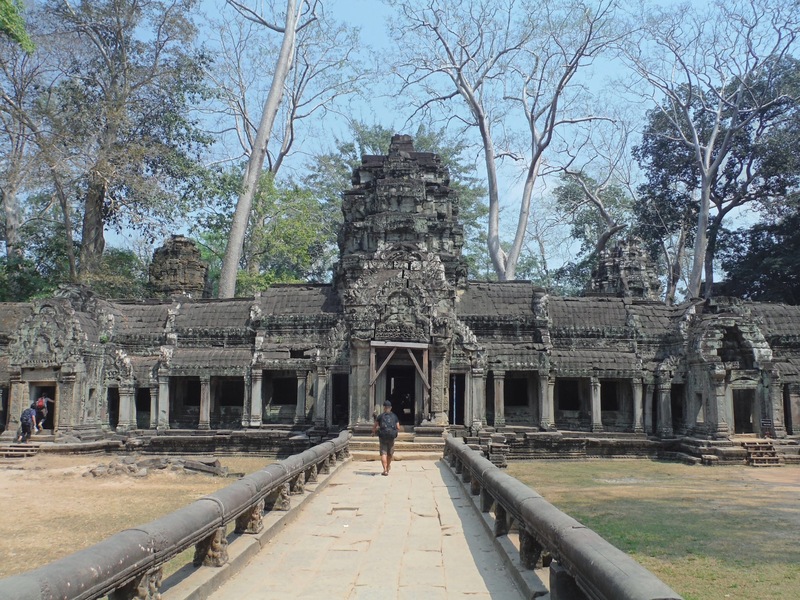 On our second day we decided not to have a tour guide so just Son met us at 10am at our hostel and took us back to Angkor. 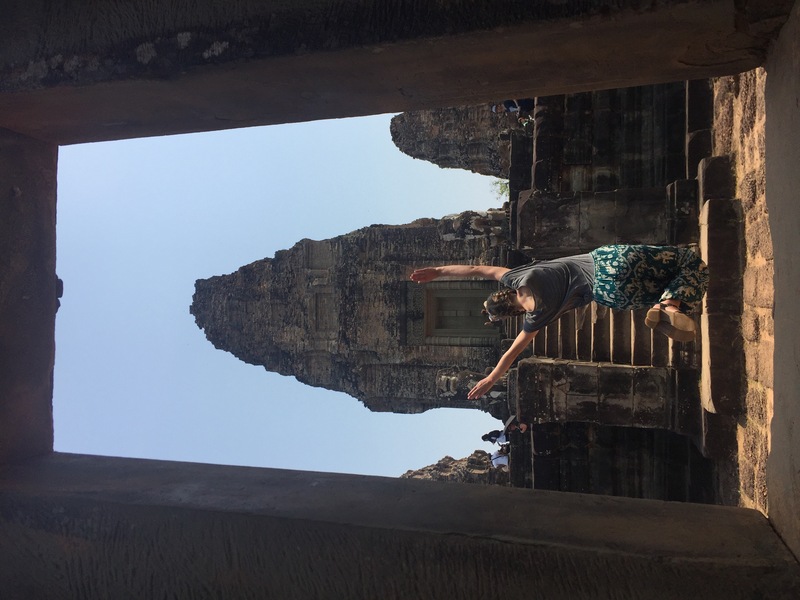 The first temple we saw was one of the oldest (circa 10th century) and as we didn’t have a tour guide to follow round, we just had fun taking silly posey photos. The day before certain tourists (not wishing to name one country in particular…) drove us mad by doing full on photo shoots with little to no awareness about who or what was around them. So we did just that the next day. Luckily, the longer route is a lot emptier as people don’t want to pay as much for the inflated tickets. We felt like without Sokpee we were powering through the temples at lightening speed so we stopped to stroll in a market. 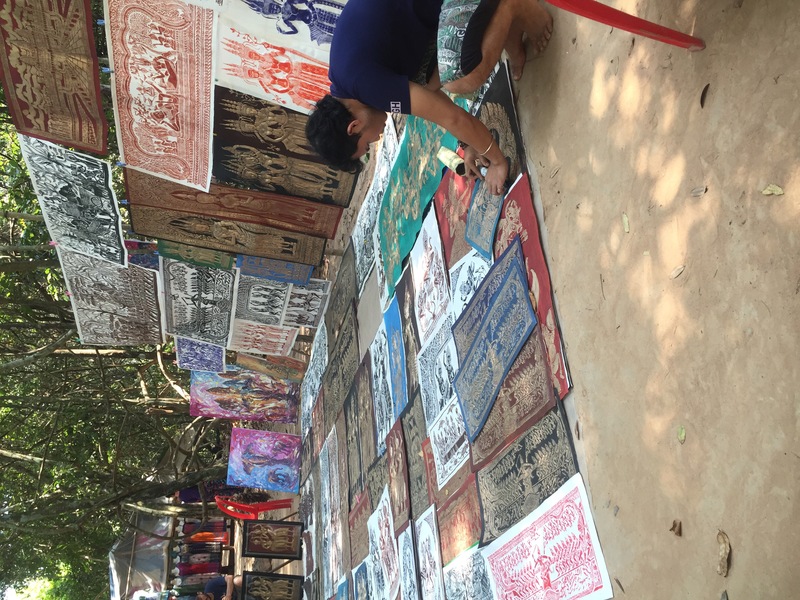 As well as the generic tops and trousers etc that we’ve seen in every market they also had 3D paintings that are made my pressing rice paper hard against some of the carvings in Angkor and then painting the background and foreground. This mans grandad had made smaller replicas out of wood for the tourists because the originals are really big. The most unique of all the temples we saw was one that was surrounded by water. 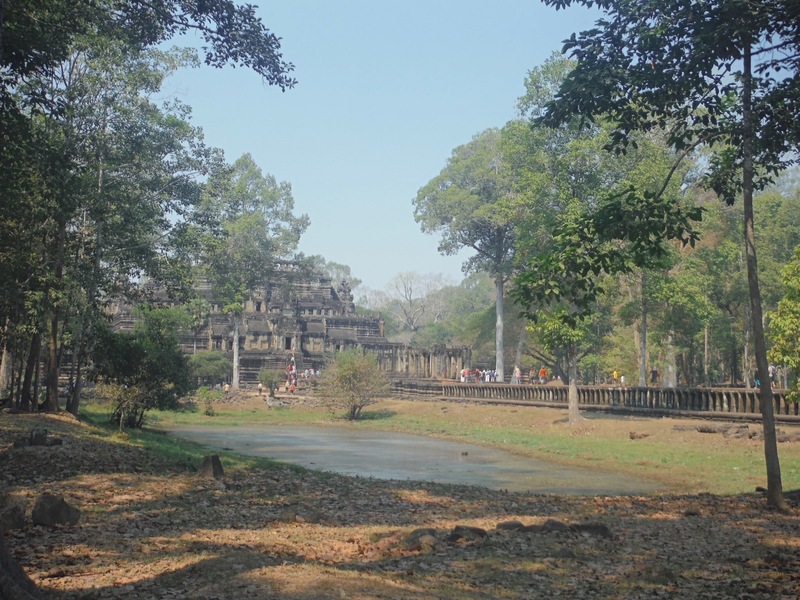 Most, if not all, of the temples have a moat and this temples moat was massive. We walked along the really long walkway and took photos of the beautiful sight around us. Nearly all the temples have a long walkway which is like the rainbow bridge from Earth up to heaven. 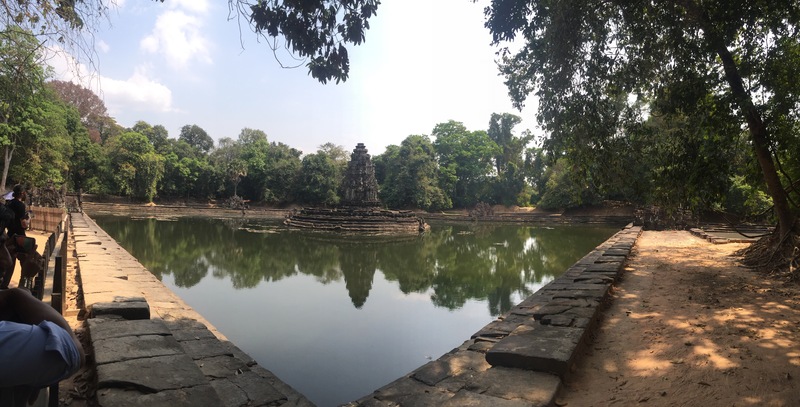 Once we arrived we saw the small temple in the middle of a 60m squared pond that was around 4-5m deep. Around the edge were 4 more smaller ponds that were 24m squared and probably represented the four elements. On our way out we were surrounded by sellers as usual selling fresh mango and pineapple but what caught my attention was the small band playing traditional music. We’d seen these bands a couple of times but this time I noticed none of them had all four limbs and a sign that explained that they were all victims of land mines. Thailand and Cambodia have had trouble in the past and now, along the border and in a few other regions, if you stray away from the beaten path, you could be at risk of finding an unexploded land mine. I think it’s great that these men who have suffered something so awful, can now play instruments and still have a job. It also acts as a warning to tourists not to be too adventurous. At this point we realised how quickly we had seen all the temples for the day and longed out lunch as long as our noodles while Son had another nap in a hammock. We headed for the last temple and enjoyed the breeze in the tuk tuk because it was such a hot day. We hiked up the hill which took about 15 minutes and got there at 4.30 thinking we’d just find a spot to sit and wait. 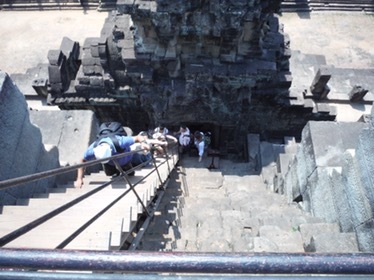 Alas, many other people had this idea and because this temple is so popular, they have a restriction that only 300 people can be up there at a time. This is the only place that has a restriction as it is the one that is deteriorating the fastest. 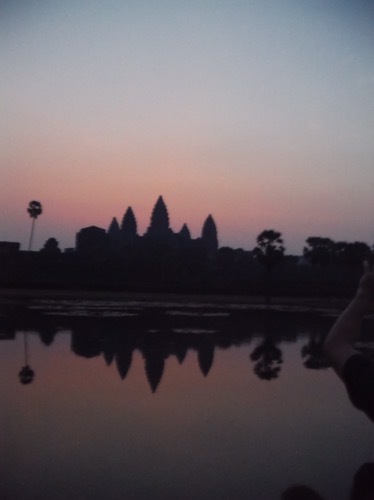 Great that they’re looking after it but annoying that we didn’t get to see the sunset over Angkor Wat. We returned to the Island Bar for dinner and made our plans for the next day. 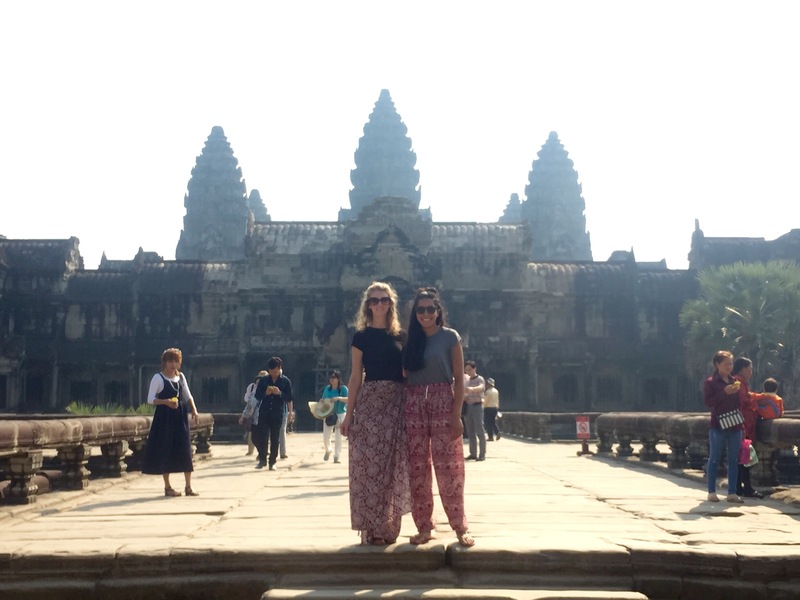 We were meant to spend 4 nights in Siem Reap but we cut it down to 3 so that we can have more time on the coast. I decided to have a traditional Khmer dish called Amok which is a fish curry and rice. It was really yummy but I felt a little bit disappointed that I’ve been preparing myself for really spicy food in Asia and I still haven’t had any! I thought this was the one but it wasn’t. Despite the fact that we needed to wake up at 5.15am, we headed to Pub Street for a drink. 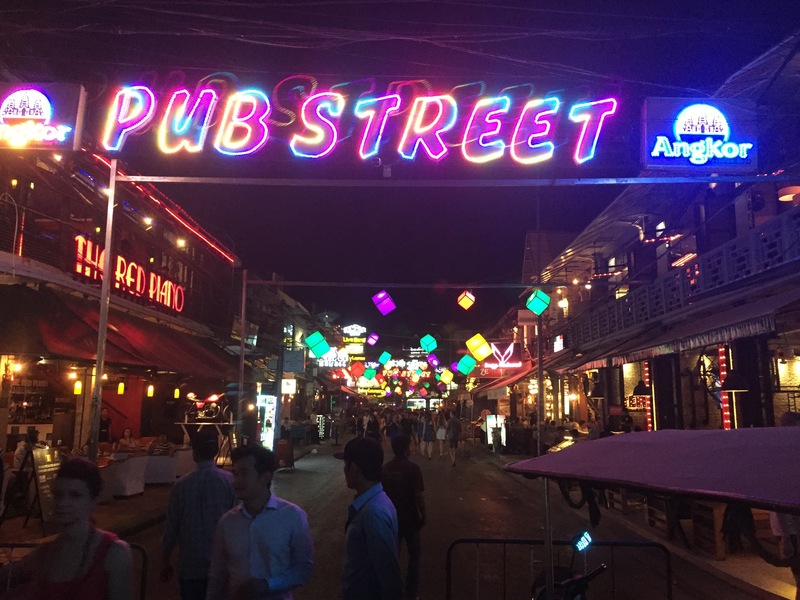 There were a few things that looked like street food stalls but were actually bars with loud music and then lots of bars down a strip. We went to one that I had seen written about somewhere and had a drink there whilst watching crazy dancers in the street. There were maybe 5-7 people dancing vogue and whacking and just really going for it and getting the crowd going. Even the girl collecting glasses at the bar opposite suddenly joined in still with her collecting basket over her shoulder! 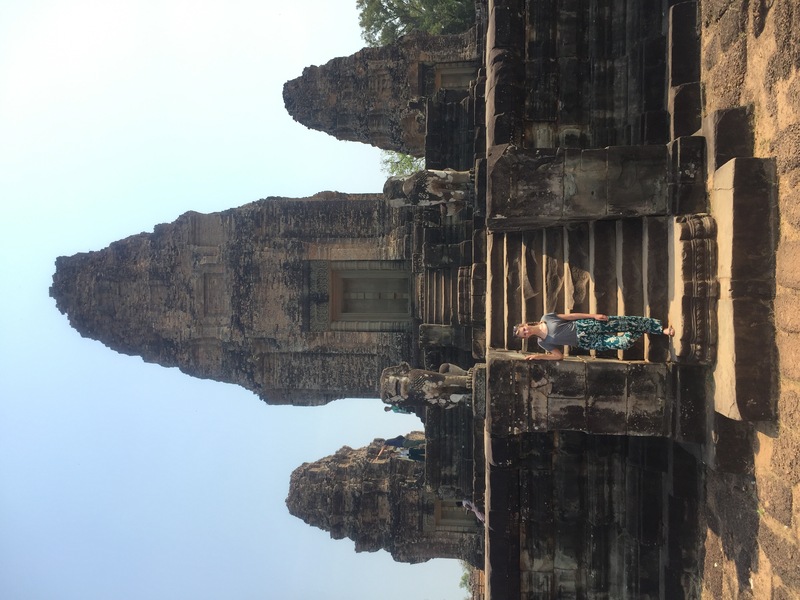 I really enjoyed Siem Reap and my first experience of Cambodia. I’m already starting to think that 10 days here is not going to be nearly enough! 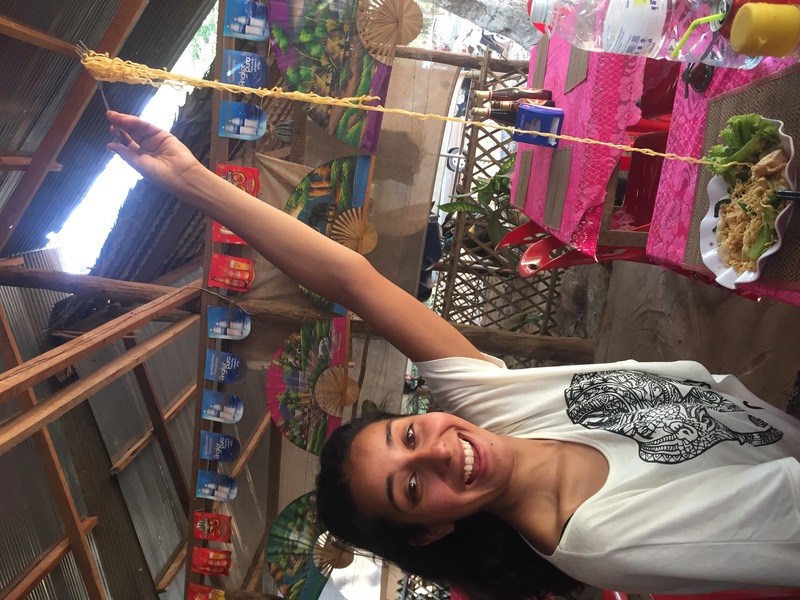 Cambodia seems perfect, Annalise! You included some very important aspects in your post! These are on my agenda for this year – all looks fantastic! 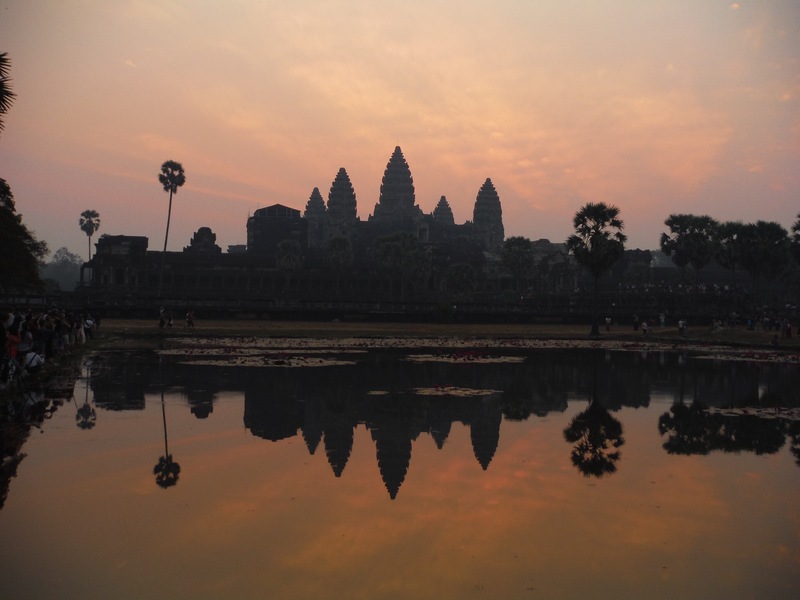 How long would you recommend to stay in Siem Reap? And in Phnom Penh? We will probably fly from Bangkok as not sure about such a long bus journey!! Did you hire the guide and tuktuk driver at the hostel? Thanks! Sorry so many questions!